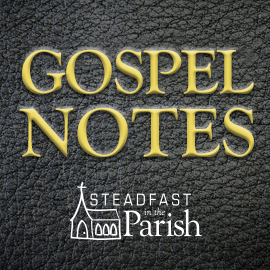 We learn about God from the words of the Apostles’ Creed. The Creed is our confession of the faith. It is also the teaching of the faith. We call it the Apostles’ Creed, not because the apostles wrote it, but because it teaches their teaching. We are baptized into the faith confessed in the Apostles’ Creed. The Creed is explained in the Catechism. The Creed has three articles. The first article teaches us about God the Father and creation. The second article teaches us about God the Son and redemption. The third article teaches us about God the Holy Spirit and sanctification. We learn that the Father created us, the Son redeemed us, and the Holy Spirit sanctifies us. In today’s Gospel Lesson, we see that the Son who redeemed us is also our Creator. 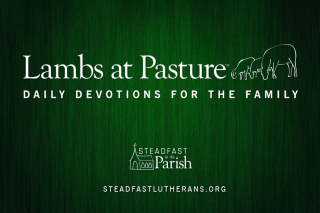 St. John writes about him, “All things were made through Him, and without Him nothing was made that was made.” (John 1:3) While we usually ascribe creation to God the Father, we also confess that the Son is our Creator. In the beginning God said, “Let there be,” and there was. God created everything out of nothing. In our text for today, Jesus says, “Make the people sit down.” He seated them for a meal that did not yet exist. All there was to eat were five loaves of bread and two small fish. There were five thousand men present, not counting women and children. From the five loaves of bread and two fish, Jesus fed them all, so that none of them went away hungry, and there were twelve baskets full of leftovers after they had eaten. By this miracle, Jesus, our Redeemer, showed himself to be our Creator who sustains those whom he made. The first and second articles of the Creed are joined together. Jesus, the Redeemer, is also the Creator. Creation and redemption are intimately related to each other. As we read on in St. John’s Gospel, Jesus tells the crowd that he fed with bread for their bodies that he is the living bread that came down from heaven. He says that his flesh and blood are real food and drink. If you eat his flesh and drink his blood you will have eternal life. The God who fed their bodies would give his body and blood up for them on the cross. He would give this same body and blood to his people in the Sacrament of the Altar. Jesus fed the five thousand. Jesus feeds us. It’s the same Jesus. You can eat the daily bread that God provides without trusting in the God who provides it. People often take for granted the means by which God provides without giving any thought to the fact that God is doing the providing. God feeds the body through means. He causes the rain and the snow to fall and the crops to grow. Production, distribution, selling, buying, eating and drinking – the whole process would fall apart in a moment without the blessing of God. We can see that Jesus did a wonderful miracle when he fed the five thousand with five loaves of bread and two fish. Can we also see that God is no less feeding our bodies today through the means that we take for granted? If God withheld his blessing, the whole economy would fall apart, there would be famine, and we would starve. Just as one receives material blessings from God whether or not he believes in God, anyone who eats and drinks the sacramental bread and wine eats and drinks the body and blood of Jesus. It is what it is whether one believes it or not. But it is only through faith that anyone receives the benefits of Christ’s body and blood. One reason – not the only reason, but an important reason – we practice closed Communion is that we do not want to welcome to the altar those who do not believe that they are receiving there, with their mouths, the very body and blood of Jesus, given and shed for the forgiveness of their sins. It is possible to eat and to drink the body and blood of the Lord to your own judgment. If you don’t recognize what you are receiving, it will hurt you, not help you. There are two kinds of eating and drinking that take place in the Lord’s Supper: oral and spiritual. The oral eating and drinking is done bodily with the mouth. The spiritual eating and drinking is through faith. Just as the mouth receives the body and blood of Jesus – because that’s what the sacramental bread and wine are – faith receives the benefits of Christ’s body and blood: forgiveness of sins, life, and salvation. It is this spiritual eating and drinking of which Jesus spoke later on in this chapter of St. John’s Gospel where he says: “Unless you eat the flesh of the Son of Man and drink His blood, you have no life in you.” (John 6:53) He is not saying that unless you receive the Lord’s Supper you have no life in you. If that were the case, we would be communing infants even as we baptize them. He is saying that if you do not believe in the flesh and blood of the Son of Man you have no life in you. With the mouth we eat and we drink the body and blood. With the heart we trust in Christ’s flesh and blood for eternal life. Death’s dread angel sheathes the sword. To hear the words of forgiveness that flow from Jesus’ crucifixion is to be fed with God’s pure grace. It comes to hungry souls who are burdened by sin. The chief sin we must confess as we come to church every Sunday, confessing our sins, listening to the absolution, hearing the gospel, and eating and drinking Christ’s body and blood, given and shed for the forgiveness of sins, is the sin of unbelief. Call it “the bird in the hand” sin. We know that a bird in the hand is worth two in the bush. But God promises us more than what we hold in our hand. He promises to take care of every need we have. He tells us to trust in him to know more than we know about what we really need. Do we? Or do we think we know better than God? First the feast of salvation and then food for our bodies; first the spiritual eating and drinking of the flesh and blood of the Son of man and then our daily bread; first the living bread from heaven and then the food to sustain our mortal bodies that will die and decay. Do you put your bodily needs before your spiritual needs? Or do you trust that the God who has provided you with your spiritual needs will also take care of your bodily needs? We confess in the explanation to the first article of the Creed that God richly and daily provides us with all we need to support this body and life. We confess in the explanation to the second article of the Creed that Jesus Christ has redeemed us, purchased and won us from sin, death, and the power of the devil, not with gold or silver, but with his holy precious blood and his innocent suffering and death. Answer this question: Would God shed his blood for you to set you free from the power of the evil one, make you his dear child, and give you eternal life, and then forget his promise to provide you with all you need to support your body and life? Would he? Effectively discern visitor friendly worship plans.